There is an amazing similarity to rough diamonds thanks to the identical cubic crystal structure – even in terms of hardness. The mysterious brilliance is brought to life by a manual cut. Each necklace is unique. Adapts perfectly to the shape of your neck. And looks great with any outfit. A statement piece with many outfits (and pleasantly low-priced, too). These spinel gemstones look like precious uncut black diamonds. They have the same alluring colour as rough diamonds as well as their unmistakeable sparkle. The difference is that this spinel necklace only costs a fraction of a £ 2,200 diamond necklace of the same size. The natural black spinel has a hardness of 8 on the Mohs scale and comes in close to the hardness of diamonds (hardness of 10 on the Mohs scale). This makes spinel gemstones extremely hardwearing and lends them the similar elegant sparkle. The cubic crystal structure is responsible for the typical faceted form. Only the facets are carefully polished. This procedure brings out the spinel’s perfect yet subtle iridescent radiance without affecting the individual shape of the gemstone. Plain synthetic spinels are all identical in appearance and simply can’t compare. A timeless, elegant piece of jewellery that will work with any item in your wardrobe – from sporty to dressy. Measures 42cm (16 ½“) in length. Weighs approx. 9g (0.3 oz). 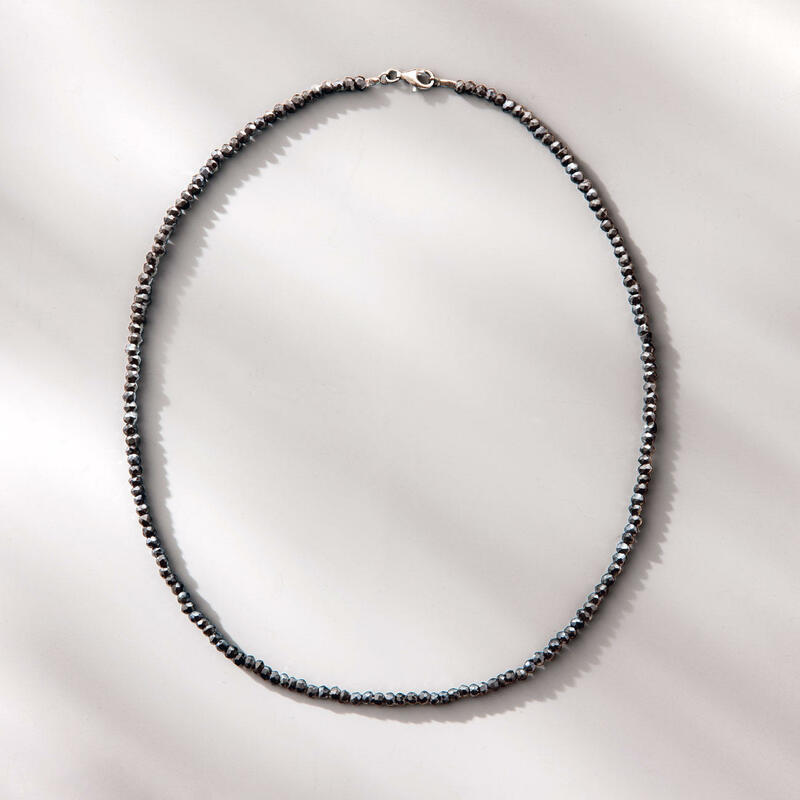 The lobster clasp is made of 925 sterling silver and has been blackened in a Parisian oxide colouring bath to match the gemstones.